The Gridiron - September 11, 2018 from Ram Country TV on Vimeo. Kick: Friday, 7, at Royersford. Series: Eagles trail 4-0 after losing 45-21 last year. Eagles update: Have bounced back with consecutive wins after playing Berks Catholic tough in season-opening 31-7 loss. ... Starting QB Kolby Haag left in second quarter last week after banging up left (non-throwing) shoulder, but offense did not miss beat under soph backup Gavin McCusker and went on to 43-10 victory over Lower Dauphin. .., Haag is expected to practice this week and be on field Friday night, according to head coach Matt Bauer. ... Haag completed 9-of-12 passes before leaving; he's Berks' third-ranked passer, with 60.3 percent completion rate, 5 TDs and 0 INTs. ... McCusker hit on 5-of-7 with TD passes to TE Matt Feeney and TE Michael Stout. ... TB Steven Rose and TB Jeremiah Nixon each topped 100 rushing yards last week and will continue to split time . ... Bauer praised play of offensive line – center Nate Brady, guards Michael McNish and David Filipello and tackles Anthony Zabala and Robbi Unruh – saying it's unit he has been most pleased about this season. ... Defense recorded 4 sacks, limited Lower Dauphin to 52 rushing yards and got INTs from S Alex Javier and CB Joe Rohrbach. ... ILB Feeney had 7 tackles, sack and blocked punt. ... ILB Riley Knapp had 7 tackles and S Nick Schaefer 5 tackles. ... WR Devon Scott is second in Berks with 14 receptions. ... Trailed 45-7 after three quarters last year against Spring-Ford. ... Have been outscored 83-27 past two seasons by Rams. Rams update: Rallied from 21-point halftime deficit to make it one-possession game in third quarter but couldn't get enough defensive stops vs. Wilson in 33-22 loss. ... Outgained Bulldogs 294-252 and had more first downs, 15-11, but had some special teams breakdowns and had trouble protecting passer. 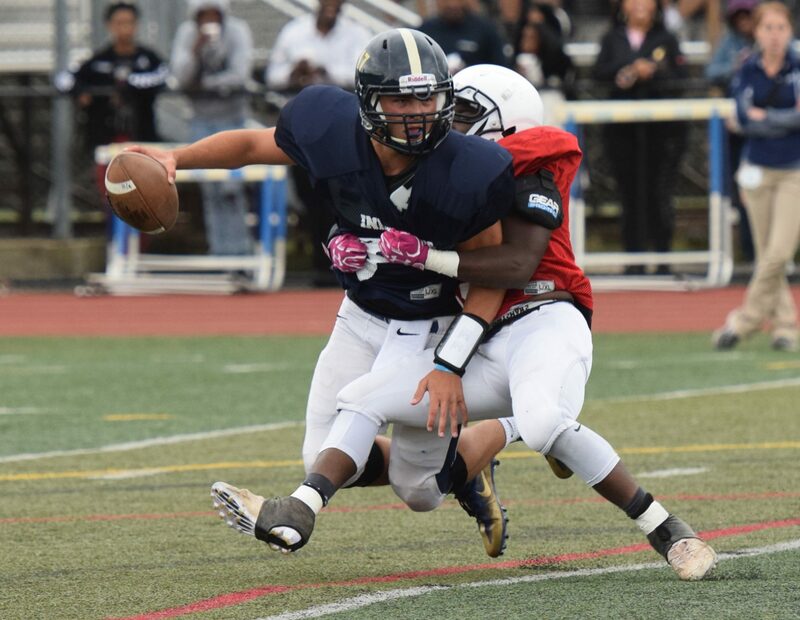 ... QB Ryan Engro connected on 18-of-30 passes for 224 yards but was sacked 6 times. ... Engro is also team's leading rusher and is averaging 7.8 yards per carry. ... Standout receiver Dante Bonanni had 8 receptions for 99 yards against Wilson; has team-leading 12 receptions for season. ... LB Nick Delromno, who had 71 tackles last season, is back to lead defense. ... Opened with 21-0 win over state-ranked Central Bucks South. ... Picked to finish second in PAC Liberty Division behind Perkiomen Valley. ... Finished 6-5 last season, losing to Neshaminy in opening round of D1 Class 6A playoffs. Fast fact: Eagles are ranked No. 1 in Berks in total offense, averaging 392 yards per game. Did you know? Spring-Ford head coach Chad Brubaker was longtime assistant coach and offensive coordinator at Wilson. This is ninth season with Rams. Quotable: “The last two years we've been beaten pretty handily (by S-F), and we stumbled into league play. They've really embarrassed us. We're going to do everything we can to give a much better effort. It's important to the kids. We want to get a little respect back. We're excited for the opportunity.” – Eagles coach Matt Bauer. Isaiah Gilmore and his Wilson teammates found a way to plug up some holes Friday night — the one in their defense, and the one in their hearts. Taking the field for the first time without their injured leader, Nick Johnson, the Bulldogs dug a little deeper and held off Spring-Ford 33-22 in a non-league game at Gurski Stadium. The Bulldogs (2-1) rose to the occasion on defense, blanking the Rams' passing game in the first half and holding it in check again when things got tight in the second half. The Rams (2-1) used two quick third-quarter touchdowns to pull within 21-14 with 5:53 left in the third quarter. The Bulldogs answered with a pair of scores, the second a 74-yard punt return by Troy Corson that essentially put it away. Wilson's defense never truly rested. Quarterback Ryan Engro and the Rams kept coming at them. They scored a TD and two-point conversion with 4:10 left to make it a two-possession game but the Bulldogs forced them to turn it over on downs on their next possession. Engro completed 19-of-32 passes for 224 yards and a pair of TDs. Eight of those completions went to standout wide receiver Dante Bonanni, but the Bulldogs were able to keep most of those passes in front of them and didn't give up any huge plays. They also kept a steady pass rush on Engro, enough to disrupt the passing game. He was sacked six times, twice by linebacker Cameron Magalotti. The Bulldogs showed a variety of defensive fronts and constantly sent linebackers at Engro. He was able to avoid several sacks with his feet but the pressure prevented him from looking downfield. The Bulldogs were dominant in the first half in building a 21-0 lead. The defense forced four punts and a turnover on downs on Spring-Ford's final five possessions. They allowed just 53 first-half yards. Anthony Futrick and Brent Gibble stung the Rams twice in the first half, hooking up for TD passes of 21 and 14 yards. Corson's 31-yard punt return to the Spring-Ford 34 set up a late first-half score. Elijah Morales ran 31 yards to the 3 on first down, then finished the job on the next play. Spring-Ford's pro-style passing attack has given Wilson's defense fits the past two seasons. 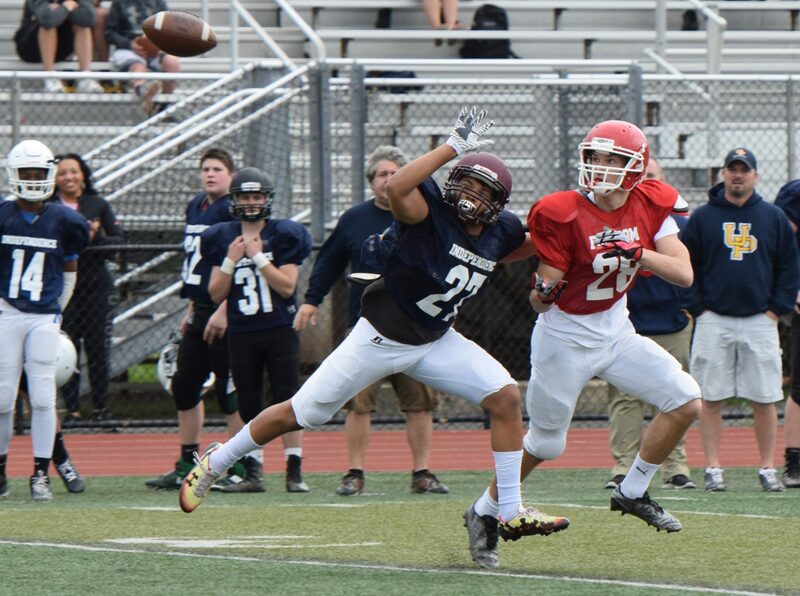 The Bulldogs were scrambling all over the field to contain all-league quarterback TJ Pergine and keep his deep well of receivers in front of them a year ago at Royersford. Pergine passed for 277 yards and wasn't stopped until the Bulldogs dialed up a couple of sacks in the final minutes. Pergine is gone, but Chad Brubaker, the former Wilson assistant, returns to Gurski Stadium Friday with the same offensive style that has pushed the Bulldogs to the limit. The Rams are 2-0, but Brubaker says his offense "hasn't even begun to scratch the surface." His new quarterback, athletic junior Ryan Engro, was knocked out early in the season opener and is still untested. "We haven't been able to unleash him yet," Brubaker said. "Hopefully, Friday we can." The Rams show up at an inopportune time for the Bulldogs (1-1), whose defense is reeling after losing its leader, senior linebacker Nick Johnson, to what appears to be a season-ending injury. At full strength the Bulldogs would've been pressed to defend the Rams' array of weapons; without him in there they'll be on their heels. "Besides the fact that he's an incredible linebacker, he makes sure everybody's in place," Wilson coach Doug Dahms said of Johnson, who broke both major bones in his lower right leg. "He gets everybody lined up right, makes sure they're straight on calls." Wilson's burgeoning rivalry with Spring-Ford is just one of several intriguing Week 2 matchups. Berks Catholic, fresh off a monster matchup vs. Central Dauphin, gets an equally big challenge from Maryland powerhouse McDonogh School. Gov. Mifflin looks for payback, and its first win, against Cocalico. Spring-Ford took a graduation hit with its offensive skill players, but plenty of talent remains. Dante Bonanni, an all-league wide receiver who caught 41 balls as a sophomore, will be Engro's top target. He'll be flanked by 6-3 senior Noah Baker, a basketball player who has returned to football for the first time since ninth grade, and 6-1 junior Blaze Scarcelle. The Rams flood the secondary with four and five receivers, overloading certain zones and forcing mismatches. "They run some nice combinations and try to rub you, get matchups on linebackers," Dahms said. "They've got a lot of height, and they run their routes pretty well. The key will be whether their quarterback can get 'em the ball." "We feel good about our skill guys," said Brubaker, who expects to get top running back Steve Brill back in the lineup (he was out last week). "We do have some experience at certain positions. We want to take advantage of things we think we do well." The Bulldogs' secondary should be better equipped to handle the passing game this year. They were relying mostly on underclassmen in last year's 28-21 win. Now, sophomore Troy Corson, junior Matt Fry and senior Isaiah Gilmore are all a little more battle-tested. "We're much better there than we were this time last year," Dahms said. Brubaker concedes the Bulldogs are the stronger team and will have an advantage up front. They did last week and were able to spring Isaiah Morales for 217 yards and three long TD runs in a 42-28 win over Mifflin. "You're not gonna see us line up like Central Dauphin did (against them) and go nose for nose; that's not what we can do right now," Brubaker said. "They're very strong, and we are way behind them, so we'll have to make up for that in other ways." Series: Bulldogs lead 2-0 after 28-21 win last year. Bulldogs update: Earned first win with 42-28 victory over Gov. Mifflin last week but suffered big loss early in game when senior LB Nick Johnson broke 2 bones in his leg and was lost for season. ... Johnson, Linebacker of Year in Section 1 of Lancaster-Lebanon League last year, is expected to have surgery. Johnson also was starting at TE. ... Junior Anthony Koper will fill Johnson's spot at ILB; senior Greg Smith will move into starting TE spot... Avanti Lockhart will begin seeing time at both ILB and TE... Elijah Morales had breakout performance against Mifflin, going for 217 yards and 3 TDs on 14 carries. Morales is averaging 11.0 yards per carry. ... S Matt Fry had 2 interceptions to help hold off late Mifflin rally. ... S Troy Corson had team-high 15 tackles. ... LB Cam Magalotti had 2 tackles for loss and INT. ... Defense allowed 193 passing yards. ... Senior QB Anthony Futrick has completed 62 percent of passes for 299 yards in 2 games. ... Iggy Reynoso scored 4 TDs, 3 on receptions, in last year's win. Rams update: Graduated most of top skills players, including all-league QB TJ Pergine and all-league RB Justin DeFrancesco. ... Junior QB Ryan Engro has completed 10-of-25 passes for 141 yards in first two starts. ... He played just one series in opener before behing knocked out... WR Dante Bonanni took over at QB in opener... Top RB Steve Brill was also lost early in that game... Bonanni had 41 receptions last season... He is one of just two returning starters on offense... LB Nick Delromno, who had 71 tackles last season, is back to lead defense that includes six return starters. ... Beat Wayne Valley, N.J., last week 31-21. ... Opened with 21-0 win over Central Bucks South. ... Picked to finish second in PAC Liberty, behind Perkiomen Valley. ... Finished 6-5 last season, losing to Neshaminy in opening round of D1 Class 6A playoffs. ... Listed among teams to watch in PennLive.com's Class 6A state rankings, along with Central Dauphin. Fast fact: Rams are looking for first 3-0 start since 2015, when they recorded perfect regular season. Did you know? Spring-Ford head coach Chad Brubaker was longtime assistant coach and offensive coordinator at Wilson. This is his ninth season with Rams. Quotable: “They've got a lot of height, and they run their routes pretty well. The key will be whether their quarterback can get 'em the ball.” – Wilson coach Doug Dahms. Quotable: "(In terms of strength) we are way behind them, so we'll have to make up for that in other ways and take advantage of things we think we do well." -- Spring-Ford coach Chad Brubaker. Series flashback: Spring-Ford's Stone Scarcelle was stopped inches short of goal line on 2-point conversion bid as Wilson held on for a 41-40, double-overtime victory at Gurski Stadium in 2016. Bulldogs got 29-yard FG from Nick Borelli to tie it at end of regulation. Wilson trailed 14-0 after quarter and 24-21 after three quarters. The Gridiron - September 4, 2018 from Ram Country TV on Vimeo. ROYERSFORD >> Heading into his first varsity start on Friday, Andrew Yoon was feeling pretty nervous. Pressed into action after an injury to Spring-Ford’s starting safety, the sophomore felt a little intimidated as he stared across the field and saw the size of his opposition. But unfortunately for the Wayne Valley Indians, Yoon got comfortable real quick, intercepting a pass, rushing for 57 yards and leading the Rams to a 31-21 victory at Coach McNelly Field. Spring-Ford got on the board first in the second quarter on an 8-yard touchdown pass from Ryan Engro to Dante Bonanni. The touchdown ended a 14-play, 85-yard drive that saw Spring-Ford convert three fourth-down opportunities, two due to defensive encroachment penalties and one on a 24-yard quarterback draw by Engro. Just two plays after taking a 7-0 lead, the Rams forced a fumble inside the Indians’ own 20-yard-line and capitalized on the turnover with a 14-yard Engro touchdown run. However, Wayne Valley responded quickly on their very next drive as Elijah Lugo snuck behind the Ram defense and was hit in stride by a pass from Ryan Michels for a 54-yard touchdown. Spring-Ford went three-and-out and Wayne Valley took over just 27 yards from the end zone after Taylor Smith was tackled while attempting a punt. The Indians quickly went to work as they moved the ball inside the 10-yard-line with less than a minute remaining in the first half. Facing a fourth-and-4 from the 9, Wayne Valley elected to kick a field goal, but a Spring-Ford defender jumped offside, negating the missed kick and giving the Indians four more shots at tying the game. Wayne Valley capitalized on the mistake three plays later when Michels hit Lugo on a play-action pass to tie the game just 10 seconds before the half. The Indians continued their attack in the second half as they forced Spring-Ford into a three-and-out before James Jun blocked a punt and gave Wayne Valley the ball inside the 10-yard-line to start their first drive of the second half. The Rams run defense held strong, forcing a third-and-goal from the 12-yard-line, but Michels tossed his third touchdown of the game to give the Indians their first lead of the game. Minutes later, the Indians had a shot to put Spring-Ford away, but faced a fourth-down situation at the Rams’ 28-yard-line. That’s when Yoon took over. The sophomore picked off the fourth-down pass from Michels and returned it 35 yards to the Wayne Valley 40, before taking his talents to the offensive side of the ball and scampering for 23 yards to set up a 32-yard touchdown pass from Engro to Noah Baker. On the ensuing Wayne Valley drive, Yoon broke up a pass on third down before Leo Van Hulst returned a punt down to the Indians’ 15-yard line. Two plays later, Engro kept the ball on a zone read and bulled his way into the end zone to put the Rams ahead, 28-21. Wayne Valley responded with a 13-play, 57-yard drive, but stalled at the 4-yard-line and ended up turning it over on downs after an incomplete pass on fourth-and-goal. From there, Engro ripped off Spring-Ford’s longest offensive play of the night, a 37-yard scramble on third-and-12 to set up a field goal and effectively ice the victory for the Rams. Engro finished the night with 200 total yards and all four of Spring-Ford’s touchdowns. Michels tossed all three of Wayne Valley’s scores and finished the day 10-for-21 with 126 yards. The Gridiron - August 28, 2018 from Ram Country TV on Vimeo. Heading into their season-opening matchup at Pa. Prep Live preseason No. 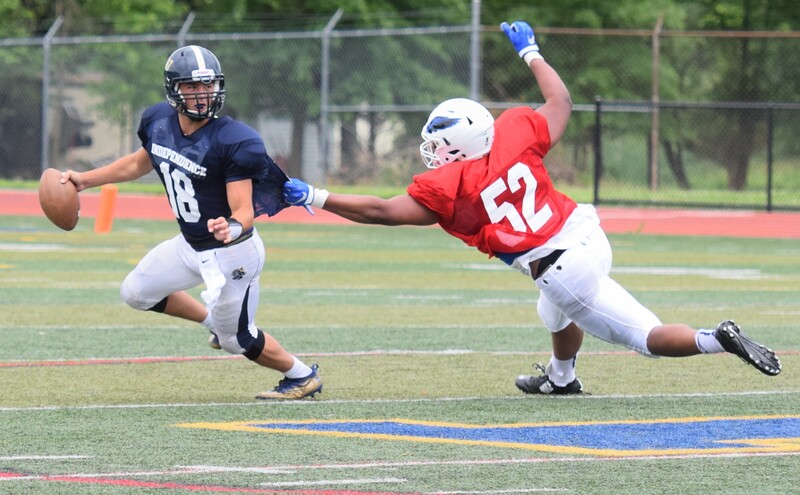 11 rated Bucks South, Spring-Ford’s players and coaches heard plenty about the Titans’ loaded, experienced defense. CB South returned seven starters from 2017, including All-State linebacker selection Matt Norris. Instead, it was the Rams’ defense — and special teams — that loudly announced their arrival as one of the area’s top units in an impressive 21-0 victory in Warrington. Two of Spring-Ford’s three touchdowns were produced by the defense and special teams, as Central Bucks South accumulated only 117 total yards of offense and seven first downs for the evening. CB South’s rushing attack was completely neutralized, ultimately losing 10 yards in total on the night. In fact, it was the Rams’ special teams that gave the team the early shot in the arm they needed. After an initial CB South three-and-out, senior Nick DelRomano broke through to get a hand on the ensuing punt, which bounced into the hands of Noah Baker. Baker’s 15-yard return put Spring-Ford on top 7-0 less than two minutes into the contest. Minutes later, senior running back/safety Stephen Brill avenged a Rams turnover by undercutting an out route and taking it 69 yards to the house, outracing a pair of CB South pursuers. The Titans found themselves down 14-0—and their vaunted defense hadn’t allowed a point. 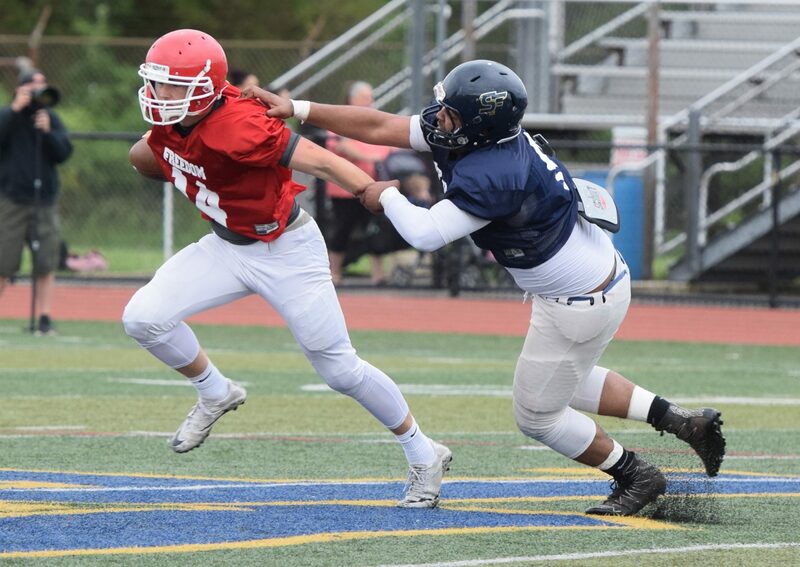 Despite losing starting quarterback Ryan Engro and later watching Brill leave due to injury, the Spring-Ford offense stayed afloat thanks to wide receiver Dante Bonanni moving behind center and steadying an inexperienced and suddenly undermanned offense. Those efforts paid off in the third quarter when Armante Haynes powered across the goal line from 23 yards out to give the Rams the final score of the evening. 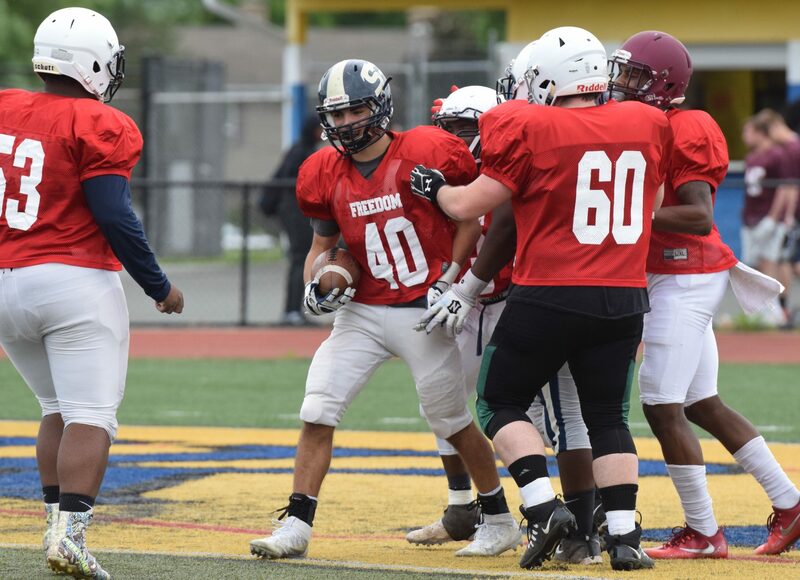 In the interim, the Spring-Ford defense stifled any attempts at a Titans rally, surviving four turnovers thanks in large part to the efforts of DelRomano and James Albert at linebacker. “James and Nick were the best linebackers on the field,” said Brubaker, high praise considering the presence of All-State performer Norris for CB South. Meanwhile, Blake Terrizzi and Nate Orkfritz-Robertson held down the fort at the defensive end, while Nick Uba, Leo Van Hulst, and Alex Koretke ably manned the secondary in Brill’s absence. In all, the unit accumulated a sack and 12 tackles for loss. K/P Taylor Smith (36.6 yards per punt) consistently made CB South traverse the length of the field with booming punts pinning the Titans deep time and again. Spring-Ford (1-0) battles Wayne Valley (N.J.), a perennial contender in North Jersey who returns 17 total starters this season. “I’ve seen their film, and that’s going to be a very strong team,” said Brubaker. Defensive Player of the Week >> Spring-Ford LB Nick DelRomano got his squad off to a flying start, charging through and blocking a Central Bucks South punt that was scooped up and returned 15 yards by Noah Baker for the game’s opening score less than two minutes into the contest. From there, DelRomano anchored a stifling Rams defense (five tackles, 2 TFL) that completely stymied the Titans’ rushing attack in a 21-0 road victory. Stopping the Wayne Valley football team this year, it would seem, would require a pretty straightforward approach. Staying doggedly focused on stopping Nick Trani sounds like a reasonable strategy. After all, Trani was an all-purpose performer last year. The senior accumulated 928 total yards (640 rushing, 207 receiving, 81 passing) and accounted for nine touchdowns (seven rushing, one receiving, one passing). Coach Roger Kotlarz just announced that Trani will serve as a captain for the second straight year. He is the first two-time captain in Wayne Valley football history. “He’s been a very important player for us for the two years in a row and that will certainly be the case again this year,” Kotlarz said. If opposing defenses are focused solely on stopping Trani, though, that could end up being a major blunder. The challenge in the backfield will be replacing the graduated Greg Poloso (304 rushing yards, 111 receiving yards) and Vincent Marrone (480 yards passing, 182 yards rushing). Speedy junior Elijah Lugo will be expected to pick up a lot of that slack. Last year, Lugo recorded 309 total yards, most of which came returning kicks (204). As the season wore on Lugo factored more and more into the rushing and receiving game and is expected to have a more prominent role this year. Senior Selum Maksut only got 11 carries last year, but managed to average 6.6 yards a pop. Senior Nick Duncan, primarily a defensive player last year, will also contribute on offense this year. Sophomore John Testa led the freshmen in rushing last year and is expected to contribute to the varsity this season. Junior Jake DeLuccia and senior David Trinidad will be big, strong, blocking backs. The team’s versatility also prompted Kotlarz to play the quarterback position close to the vest this summer. Senior Ryan Michels threw for 840 yards while starting in just six games last year. Michels is locked in a battle for the top job with junior Tommy Moran, who had a big year passing and running as the JV quarterback last year. Trani, who threw 10 times last year, will likely be used in similar fashion this year. Whoever ends up throwing the ball will have plenty of talented, yet inexperienced options downfield. Lost to graduation are AJ Tedesco (525 yards receiving) and James Pollack (357 yards receiving). Senior Sam Bumbaco is the lone returning receiver with a lot of experience. Several prominent JV players from last year are vying for playing time. That includes outside receivers senior Sean Roberts and junior Chase Hemming; and inside receivers senior Max Flicker and sophomore James Jung. Senior tight end Danny Murphy (captain), utilized more as a blocker last year, is expected to be a bigger downfield threat this year. Junior Anthony DePalma will also be utilized as a tight end this year. The offensive line, meanwhile, will feature four returning starters: junior center Ricky Ruggiero, senior guard Joe Esposito (captain), junior guard Jordan Botero and junior tackle Ian Lancelotti. Senior Greg Fox, primarily a defensive player, will also factor into the plan on offense. Juniors Steve Simonetti and Frank Tortora are expected to contribute up front. The defensive line returns three starters: Fox (37 tackles), Trinidad (36 tackles) and Lancelotti (23 tackles). All three were hampered by injury last year, but are currently 100 percent. Ruggiero, Botero, senior Shaquai Anderson and junior Justin Lopez will provide depth on the defensive line. Despite losses to graduation of Shane Connelly, Tyler DiMaio and Gabe Ortiz, Kotlarz considers both lines to be “stout and strong” this year. The linebacking core loses Poloso (94 tackles), Isaac Rosado (60 tackles) and Trinidad (to the defensive line), but returns Trani (108 tackles). DeLuccia, a key linebacker off the bench last year, will start alongside Trani in the middle this year. Murphy and Maksut, key contributors off the bench last year, will man the outside. Senior Kevin Schneeloch, Testa and Tortora will add depth at linebacker. Safeties Bumbaco (70 tackles) and Duncan (57 tackles) are the leading returning defensive backs this year. Senior Ali Gega will add depth. The cornerbacks will be senior Liam Dring, Moran and Lugo. Wayne Valley opens up August 31 at Pennsylvania powerhouse Spring Ford. As Wayne Valley football coach Roger Kotlarz walked off the field after the season-ending loss to Jefferson last year, he turned to a group of assistant coaches and made a quick comment. “Well, at least we now have a rally cry for next year,” he said. Wayne Valley had just finished the season with a 1-9 record. That automatically gave the team its mission for 2018 - prove that 2017 was a fluke. Wayne Valley went 9-3 and reached the state sectional finals at MetLife Stadium in 2016. They went 9-2 and reached the state sectional semifinals in 2015. Those two years, according to Kotlarz, are still “recent history” and very much “ingrained” in the memories of his players. Trani and Trinidad started the entire 2016 season as sophomores. Trani, a middle linebacker, recorded 87 tackles. Trinidad, an outside linebacker, had 38 tackles, eight for a loss. He was also credited with several forced fumbles. Fox, as a sophomore, spent part of 2016 on the JV and as a varsity backup before being inserted as a starter at the end of the regular season. The lineman recorded 16 tackles in just four games. DeLuccia spent most of the year on the freshman and JV teams before being inserted onto the varsity as the starting long snapper. Trani had another amazing year as a junior, recording 108 tackles. On offense, he proved to be exceedingly versatile, accumulating 928 total yards (640 rushing, 207 receiving, 81 passing). He also accounted for nine touchdowns (seven rushing, one receiving, one passing). Trani, however, doesn’t feel that this year’s team is similar to 2016. Fox and Trinidad were bothered by nagging injuries last year, but still had strong seasons with 37 and 36 tackles, respectively. DeLuccia was utilized again mainly as a long snapper as a sophomore last year, also filling in at linebacker (18 tackles) and fullback. Kotlarz envisions DeLuccia having a major role on offense and defense this year and next. 2018 Offensive Outlook: Although mostly young and inexperienced, we like our returning skills kids. We lost a lot on the offensive line and do not have a ton of depth, so that is an area of concern. We will need senior leadership from James Begg and Dante Ciocci up front. Ryan Engro (Jr.) won the QB spot. 2018 Defensive Outlook: We return our two leading tacklers in Nick Delromano and James Albert, as well as 3/4 of our secondary, Stephen Brill, Leo Van Hulst, and Nick Uba. Due to depth issues on the defensive line, we are going to have to move guys around to try to fortify our unit. 2018 Special Teams Outlook: Taylor Smith had an outstanding junior year and is back for us. He has had an excellent off-season for us and will be even better. Click on the truck to buy your raffle tickets!! RED HILL >> When it came time for Owen J. Roberts football coach Rich Kolka to draft his team for the Pioneer Athletic Conference Senior Bowl, he definitely had a plan in mind. He selected OJR all-time career touchdown pass leader Dawson Stuart and Jerry Kapp, who set a record for career receiving yards at Boyertown, to spearhead a prominent passing attack. 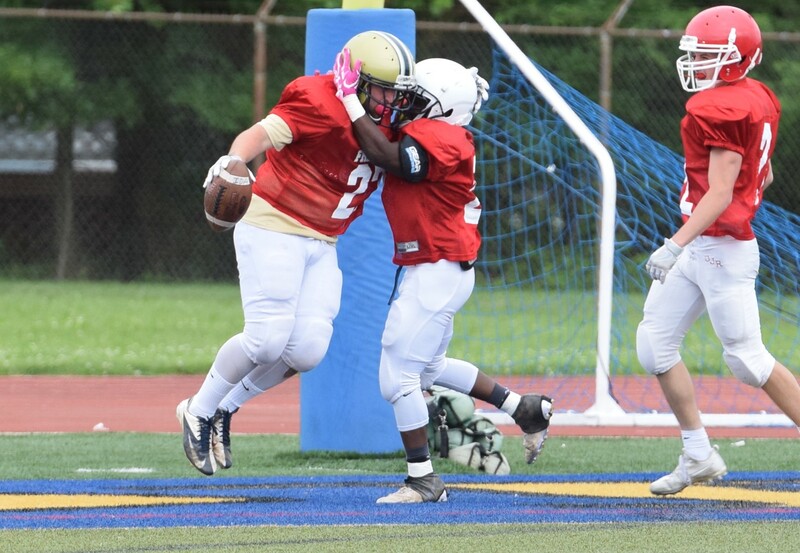 That selection strategy worked like a charm as the talented duo teamed up for two touchdowns in the first half Sunday afternoon that sparked their Freedom Team to a 36-20 win over the Independence Team in the seventh annual all-star contest at Upper Perkiomen’s Indian Stadium. Stuart went 12-for-18 for 135 yards and also threw a TD pass to Spring-Ford’s Mitchell Vagnozzi as the Freedom squad built a 29-0 halftime advantage. 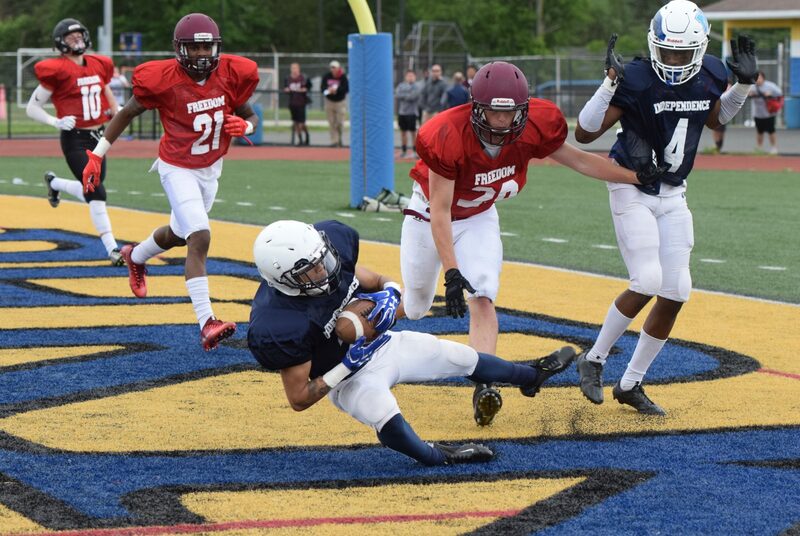 Pope John Paul II’s Jake Bildstein ran 32 yards for a score and Pottsgrove’s Dez Austin caught two passes for a total of 81 yards from Spring-Ford’s T.J. Pergine for the Independence Team. “That was a priority of mine to get those two together,” Kolka said concerning Kapp and Stuart. The Independence squad had a tough time holding onto the ball in the first half, fumbling it away five times due to a combination of errant snaps and pitches and some hard defensive hits. Upper Merion’s Preston Hampton returned one of those fumbles 41 yards for the game’s opening score. Then Stuart hit Kapp from 13 yards out soon after another fumble in the opening quarter and lofted a pass into the right corner of the end zone to Kapp early in the second quarter for a 20-0 lead. Independence got on the board in the second half on a 10-yard touchdown toss from Pergine to Pottstown’s Jamal Adams and closed to within 29-12 on Bildstein’s burst. But Spring-Ford’s Justin DeFrancesco countered with a 20-yard touchdown run and front flip into the end zone to wrap up the win with under seven minutes to go. Head coaches Kolka and Tom Hontz from Upper Perk drafted the teams in February. Any PAC senior was able to declare himself eligible. 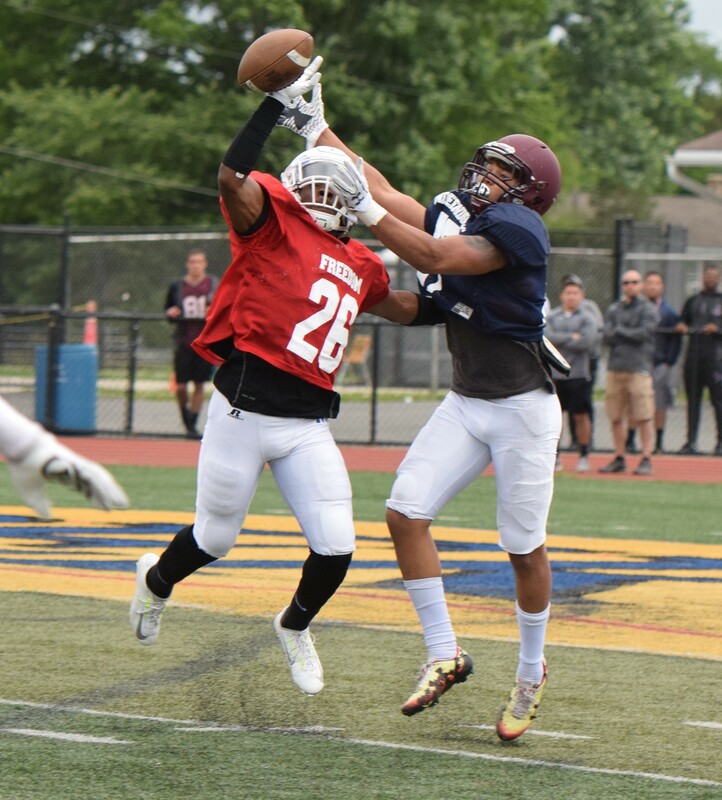 Kolka also selected Pottsgrove record-setting running back Rahsul Faison, who did not play since he is on the Pennsylvania roster for the Big 33 Football Classic on June 16. The Freedom Team practiced three times, on a Sunday and two weekdays. Both Stuart and Kapp had good things to say about Norristown defensive end Tyler Tate, who was a key factor in shutting down the Independence side in the first half. “He was impressive against us, so I picked him,” added Kolka. The Independence team wound up with a 199-165 advantage in total yards. Kapp had the chance to play against some of his high school teammates, as did many others on both sides. Kapp (Seton Hill) and Stuart (East Stroudsburg) could face each other in September when their college teams meet in Week 2 of the season. Lincoln’s Sammy Karr trying to escape the grasp of an Olney defender in a Public League game last season. The 17th annual Pennsylvania Scholastic Football Coaches Association all-star game will be played at 2 p.m. Sunday at Mansion Park Stadium in Altoona. 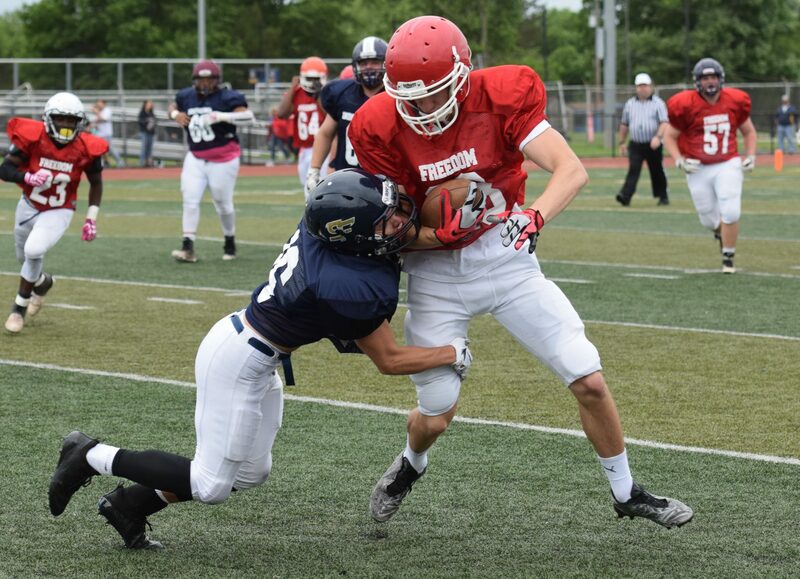 Spring-Ford’s Chad Brubaker will guide the East squad vs. the West team. One of his assistants will be Chas Cathers, who stepped down as Central Bucks West’s head coach after last season. Spring-Ford Noah Silva (73) is congratulated after tackling a Chester running back. Spring-Ford head coach Chad Brubaker. 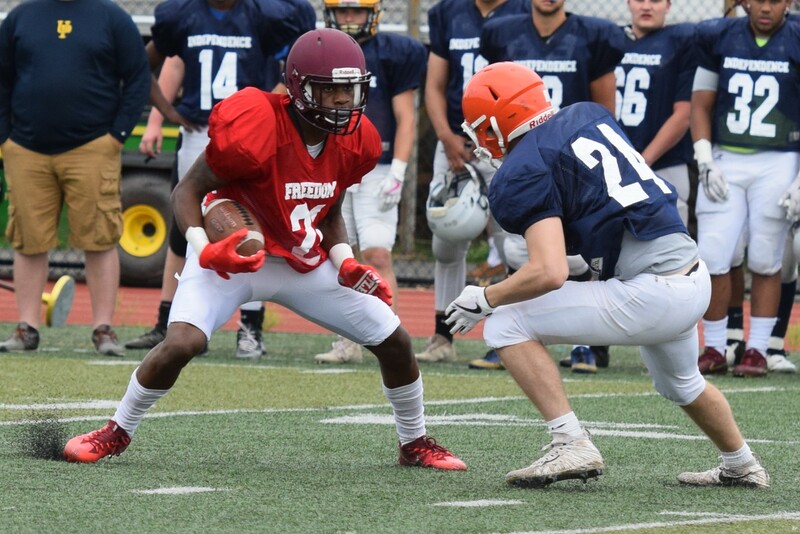 1 DB Robert Kennedy Jeannette 5’10 175 Lackawanna C.C. 10 DB Jayquan Smith Woodland Hills 6’1 177 Lackawanna C.C. HUNTINGTON, W.Va. – As a walk-on wide receiver, and the Marshall football program’s only player from the state of Pennsylvania, Stone Scarcelle has made it a mission to stand out. The 6-foot-1, 198-pound freshman from Collegeville, Pennsylvania, first did this last August during preseason camp. As a true freshman, Scarcelle flashed the potential of a player who could immediately be involved in the mix as a pass catcher. Then, during a Saturday practice on a sunny day, he landed awkwardly out of bounds attempting to make a catch and fractured his left elbow. He missed the 2017 season, used a redshirt and began working his way back. Scarcelle has shown he is a consistent, steady receiver this spring, Baker said. Scarcelle had football scholarship offers to Patriot and Ivy League schools after a standout career at Spring-Ford High School in Royersford, Pennsylvania, but wanted to pursue opportunities at the Division I level. “I wanted to see if I could make it,” Scarcelle said. He caught the eye of assistant coach Todd Goebbel and impressed head coach Doc Holliday, and received an invitation to join the program as a walk-on during a visit to campus. Stone was born at Phoenixville Hospital, which is about 25 miles northwest of Philadelphia. Stone has a distinctly Philadelphia accent, and grew up idolizing Eagles great Randall Cunningham because Cunningham, like Stone, was a quarterback who moonlighted as a punter. Stone played QB, running back, safety and cornerback, too, but found his home at receiver. The Marshall coaching staff is happy about that development. That caught the coaching staff’s eye last August, too, before injury struck. Stone put in the extra effort to leap and reach for a ball that initially looked uncatchable, and he ultimately fell harshly to the ground on his left side. His first collegiate season ended before it began. The redshirt season did not go to waste. Stone watched a talented trio of starters – Tyre Brady, Willie Johnson and Marcel Williams – break out in their first full seasons with the Herd. That gives him hope that he, too, can find a role right away. If you’re wondering, there is no back story to Stone’s name. The Scarcelles essentially picked the name out of a hat, and then gave Stone the middle name of Patrick. He also has a younger brother named Blaize. Stone currently majors in Geology, which seems apropos given his name, but after enduring the injury and recovery, Stone has his eyes on an education that would steer him toward athletic training or the medical field. Stone studies football, too. His father calls him a gym rat, and Stone immerses himself in watching film. He believes he was meant to flourish in the offense of first-year coordinator Tim Cramsey, a native of Allentown, Pennsylvania, about 40 miles from Stone's hometown. Registration for the Spring-Ford Youth Football & Cheerleading program is now open! The program provides Flag and Tackle football programs for boys ages K – 6 and Cheerleading programs for girls K – 8. The Spring-Ford Youth Football & Cheerleading program is a nonprofit organization with a current enrollment of over 500 boys & girls and their families. During the season, players, cheerleaders and parents participate in many activities such as a Pep Rally, Ram Bowl, and Youth Night at the local High School. Our primary goal is to inspire youth to practice the ideals of health, citizenship, and character. For more information on registering for the upcoming 2018 season, please click on the registration link at http://sfyouthfootball.siplay.com/site. For additional information about the program, please visit our website at http://sfyouthfootballandcheer.com. We are celebrating our 11th Anniversary! We hope that you would join us in the fun this upcoming season!